Watermanagement for industrial process water make up, side stream treatment, end of pipe treatment and effluent polishing. We have applications for the chemical industry, petro-chemical industry, pharmaceutical industry, food and beverage industry, waste processing industry, etc. 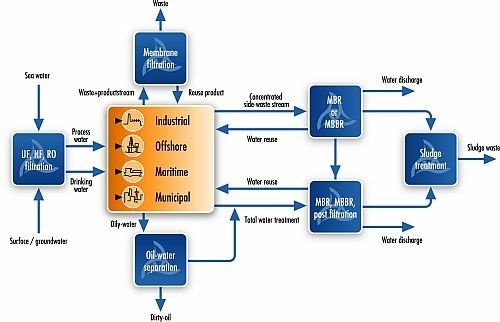 Watermanagement for offshore location, including drinking water production, bilge water treatment domestic wastewater treatment and reuse. Water management on board of ships, including drinking water production, bilge water treatment and domestic wastewater treatment and reuse. We have applications for research vessels, barges, navy vessels, luxury yachts, and accommodation platforms. Solutions for decentralised wastewater treatment for domestic wastewater with a capacity up to 2000 persons. We also provide mobile units (containerized). We have applications for holiday resorts, hotels, peace-keeping missions, small villages, etc.